I’ve a confession to make… Today’s outing necessitated wearing flip-flops due to the crazy humidity that has suffocated London and the vast amounts of walking I knew we’d end up doing. The flip-flops were co-ordinated with my neon yellow nails though so at least I was wearing flats in style. 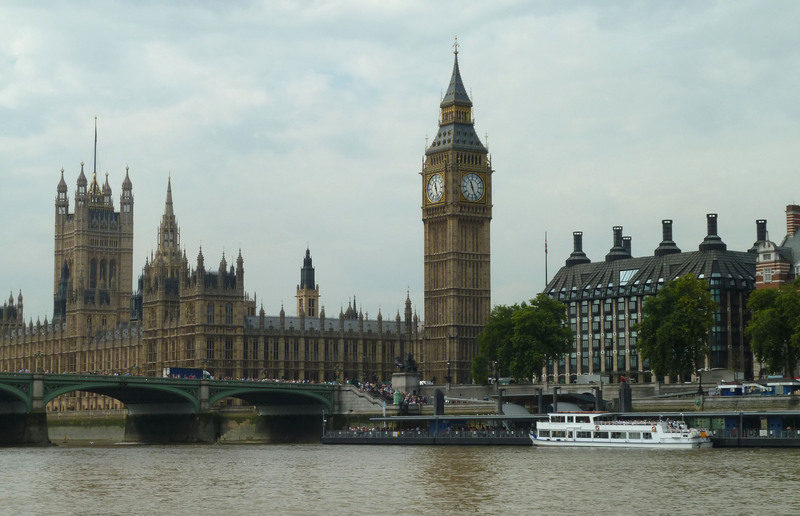 Parliament from the Thames. Own photograph. In my opinion, the best way to get to Greenwich is by boat. 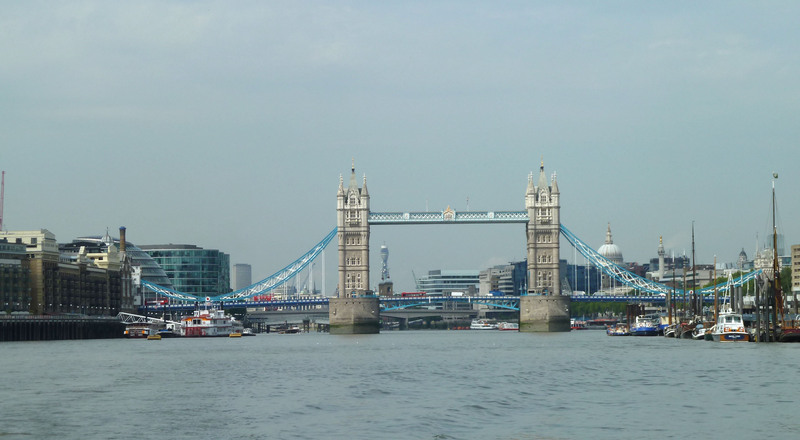 River travel used to be the predominant means of transport up and down the Thames and we often forget what a great and quick method this is. Thames Clippers, our commuter boats, are London’s vaporetti and I disembarked at Greenwich Pier. Approaching from the water, the view of the Old Royal Naval College majestically fronting the Thames is unsurpassable. Originally the Royal Hospital for Seaman – the Greenwich pensioners used to wear blue coats like the red ones of their Chelsea counterparts – and later the officer training centre for the Royal Navy, these 18th century Christopher Wren buildings, on the site of the former Greenwich Palace, are stunning. Wren’s symmetrical arrangement of courtyards, domes and colonnades works around a central axis and the buildings stand virtually unchanged from his original plans. Even if you’ve not visited before they probably look familiar having featured in so many films and period dramas, most recently in The King’s Speech (wonderful by the way). 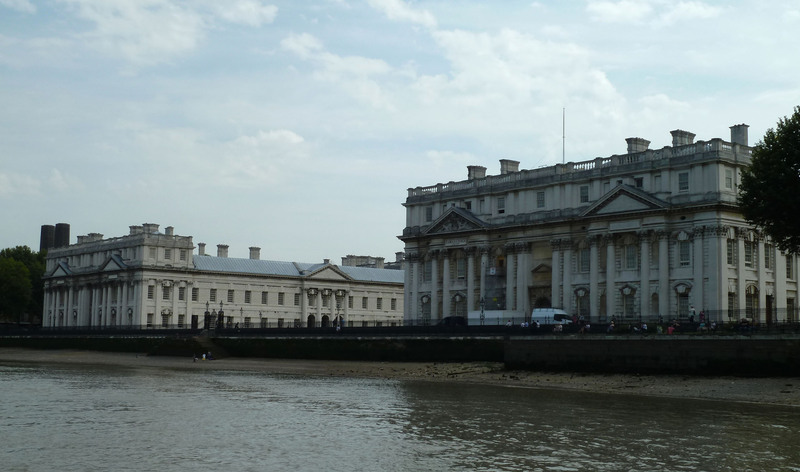 The Old Royal Naval College from the water. Own photograph. 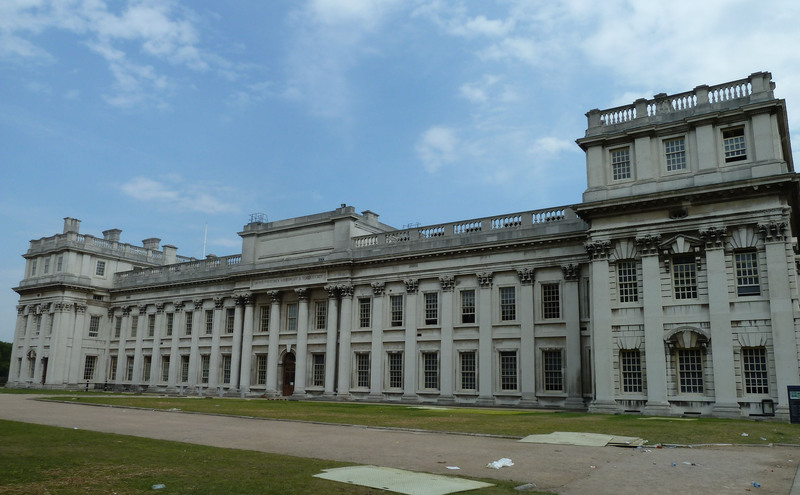 The Old Naval College now houses Greenwich University and Trinity College of Music – jazz melodies from the summer schools floated out across the quads. Part of the Old Royal Naval College. Own photograph. My first, and most important, stop was The Painted Hall. One of Europe’s finest banqueting halls, this took Sir James Thornhill 19 years to paint. Supposedly he was paid £3 per square yard on the ceiling and £1 for the walls making a grand total of £6,685. And that was then! The artist’s skill is remarkable and his use of trompe l’oeil and grisaille is most realistic. The Vestibule entrance includes three fascinating plaques listing donations towards the cost of the building. The paintings reference the Hospital’s Royal patrons and the importance of the Navy, interwoven with stories from Classical mythology. The main theme tells the triumph of Peace and Liberty over Tyranny, paying tribute to William and Mary and British Maritime Power. The Naval College’s own website has a wonderful analysis of the paintings. 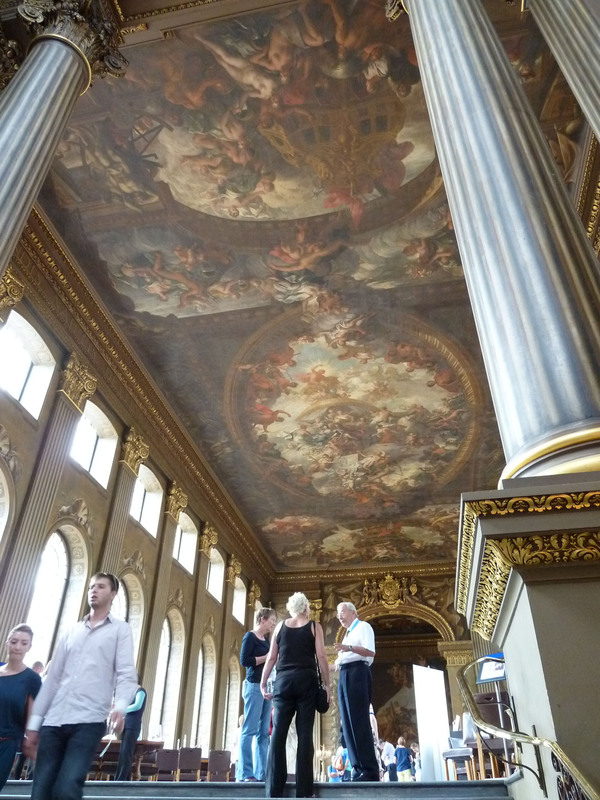 The Painted Hall. Own photograph. A particularly nice touch, and the quirky sort of thing that makes me smile, is a facsimile of the original An Explanation of the Painting in the Royal Hospital at Greenwich written by Thornhill himself that they have on sale for only £1 (they don’t have this in the shop and don’t really have a float so make sure you have change). 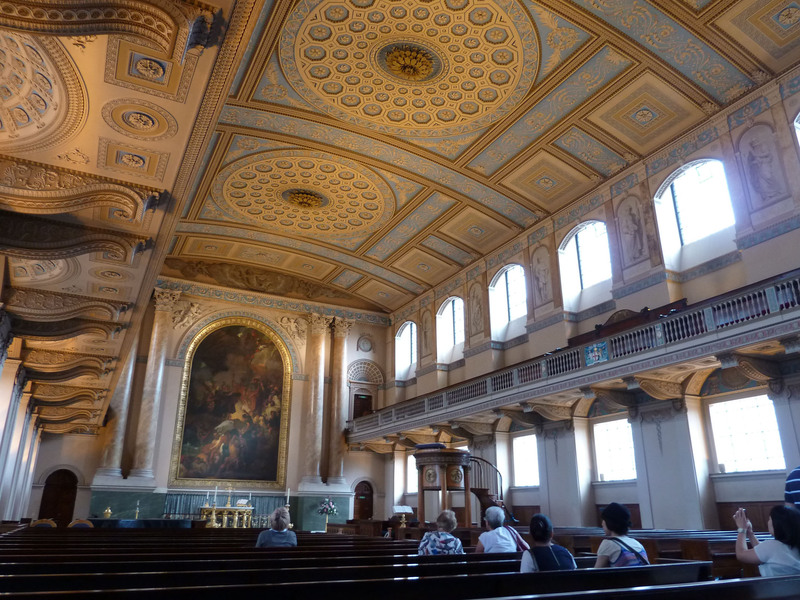 You couldn’t go to Greenwich and not visit the Painted Chapel. In fact, if you only have time to visit one thing here then make sure it is this building (admittedly, this is coming from a slightly biased 18th century art historian’s point of view). Next, and directly opposite, is the Chapel of St Peter and St Paul, a neo-Classical chapel built by James Stuart and William Newton and finished in 1751. The Chapel contains a beautiful mix of Greek and naval imagery that covers nearly every surface. 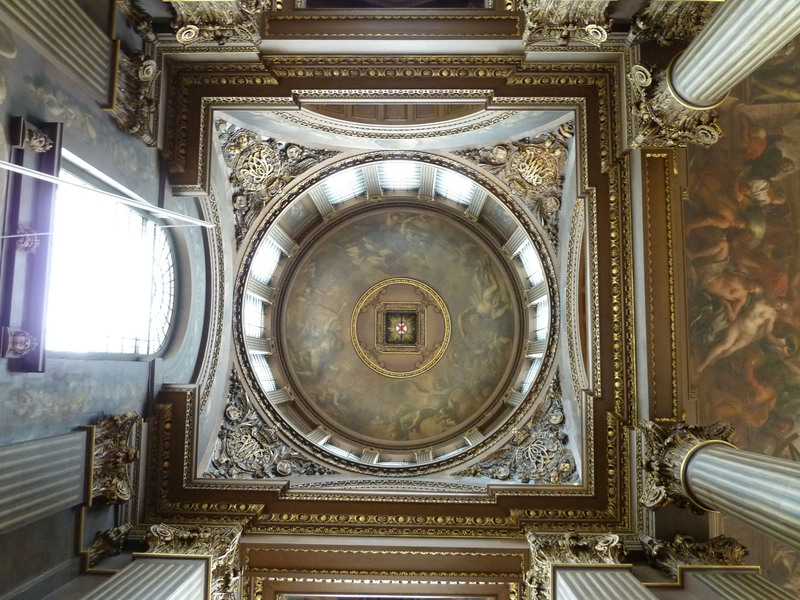 If you don’t have a neckache from staring at the ceiling in the Painted Hall, you will have by the time you’ve finished gazing up in here. 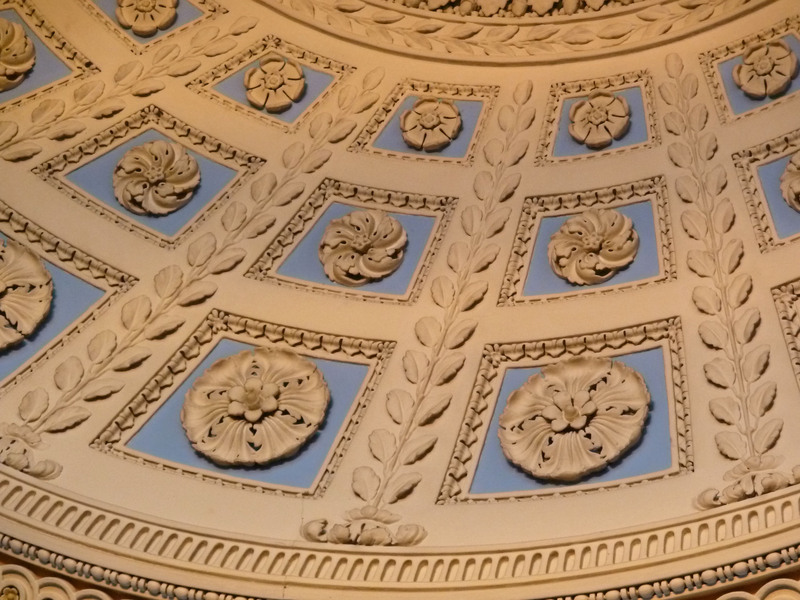 The ceiling design of squares and octagons with centrally positioned ornate details were carved by a master plasterer – it is truly fabulous and a testament to the craftman’s skill that this looks like painted wood. The colour scheme is Wedgewood-inspired contrasting with the beautiful black and white marble floor. The Chapel Ceiling. Own photograph. Above the altar hangs a work by Benjamin West showing St Paul’s Shipwreck on the Island of Malta. It is one of West’s only paintings to remain in the place for which it was commissioned. The Chapel showing West’s painting. Own photograph. 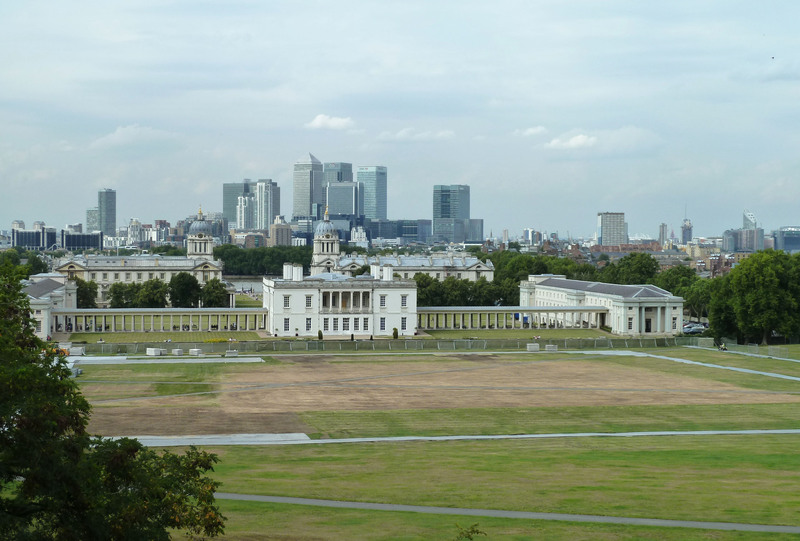 The World Heritage Site at Greenwich is full of places to visit and things to do. After a pub lunch at the Trafalgar Tavern (as depicted by Jacques-Joseph Tissot), we headed off to the National Maritime Museum, the largest of its kind in the world, which tells the story of Britain’s maritime past. 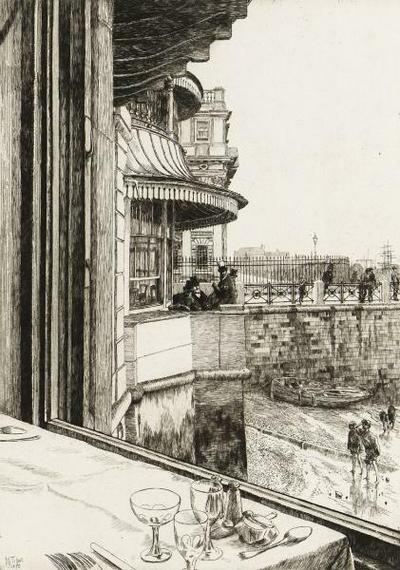 Jacques-Joseph Tissot, The Trafalgar Tavern, 1878. Image via www.portcities.org.uk. I don’t wish to do the museum an injustice and I’m sure it is brilliant but maritime history isn’t really what lights my fire and this was quite a quick visit. But, suffering a moment of madness, I went in a simulator for the Volvo Ocean Yacht race. Now, I hadn’t heard of this race but after my ‘extreme’ experience of the dangers of being at sea I had a google. This race is exceptional – the Everest of Sailing – and takes nine months to complete where crews of only 11 sail 39,000 nautical miles around the world’s most treacherous seas. It is thought to be one of the most demanding team sporting events in the world. I was exhausted after my 4 minutes so I don’t think I’ll have an invitation to crew on the next race. 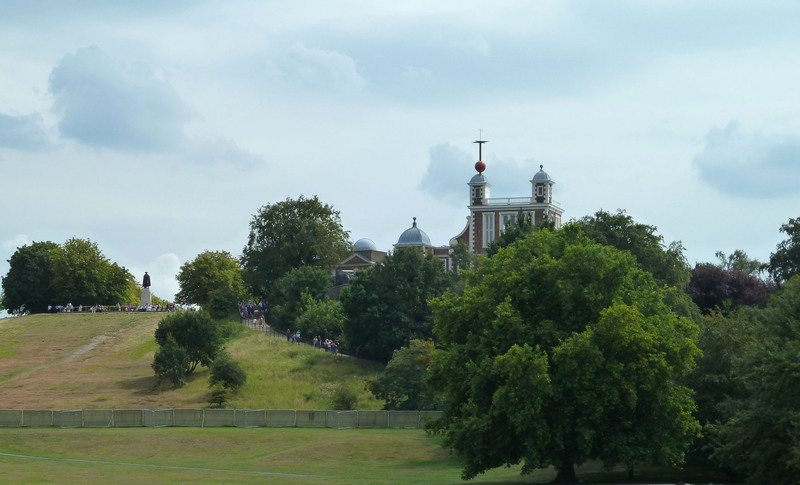 Also nearby and well worth a visit is The Queen’s House, commissioned by Anne of Denmark, and the Royal Observatory (be warned this is up a fairly steep hill so thank heavens I wasn’t in the heels), home to Greenwich Mean Time and the Prime Meridian of the World. The Observatory at Greenwich. Own photograph. It probably goes without saying but the views from the Observatory are stunning (it has a great view of the Equestrian area for the 2012 Olympics). Looking down from The Observatory. Own photograph. 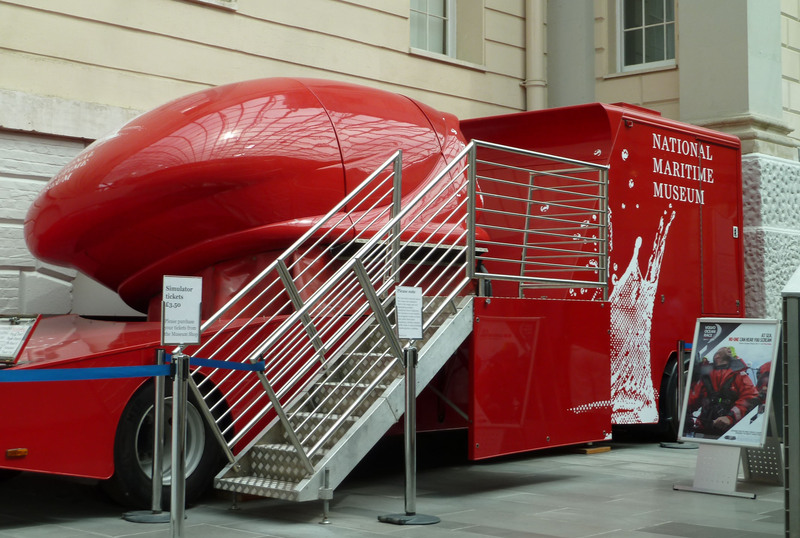 Having crammed in quite a lot for one day, I headed back to the Clipper where a welcome splash cooled me down as we pulled away. I’ve always loved being on the water and “simply messing about in boats”.